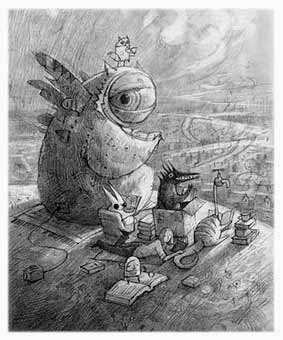 If you haven’t yet read the works of Shaun Tan, do yourself a favor and get to the nearest bookstore or library and partake of the feast of stories and images he offers. 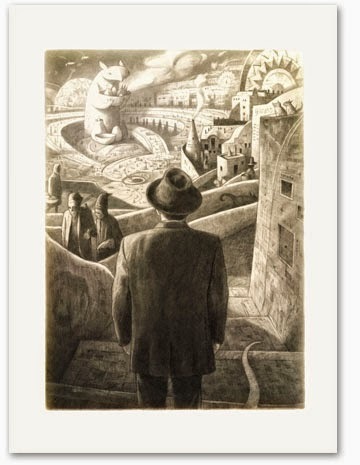 He is quite possibly my favorite writer of illustrated books. I hesitate to call him a children’s book writer, although that’s how he’s marketed. But like many writers pushed into that category because markets are so narrowly defined, he is a storyteller for all ages. 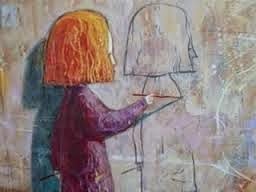 I think as we age out of picture books and take on the allegedly more serious task of reading only text, we begin to lose some of our visual literacy. We become blind to the images and wonder all around us. Adults watch television and movies, we play video games and read on-line reports rich with photographs, but we deny ourselves the “childish” pleasure of reading picture and illustrated books. 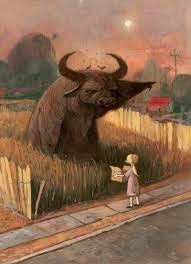 Fortunately I never saw picture books as any different from any other visual delight. Except for a brief time in my teens, I never gave up reading them. I did give up book collecting for awhile, but last year when I “read” Tan’s wordless tale of immigration, The Arrival, it re-awakened a desire to own books. I want to see these images again and again. They reveal new things at each reading. 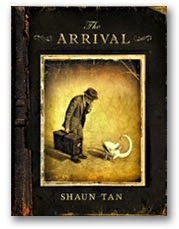 The Arrival is the tale of a family immigrating from a land infested with some unnamed evil. The father goes first and discovers a sort of utopia, filled with strange and bewildering things. 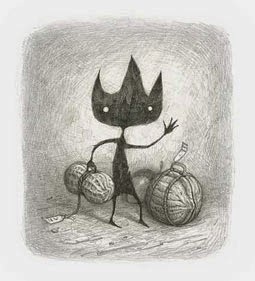 It’s also a land filled with other immigrants and their stories unfold in deft complex graphite drawings. It’s the best visual storytelling I’ve seen and is definitely a good read for adults. Tan lives in Australia, where his father immigrated from Malaysia. The Arrival, though, is about the whole experience of immigration and the thin line between chaos and order. In a world filled with distopian stories, though, this one fills the reader with hope and a glimpse at utopia. 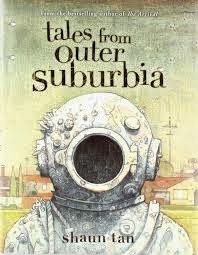 Next I read Tales from Outer Suburbia and it immediately became an old friend and companion. I often reach for it in the middle of the night and let myself be transported. The charm of Tan’s stories is that they aren’t so much an escape from this world, but a way of looking at it with new eyes. There is boredom, depression, fear, loss, and loneliness. His gift is his ability to refocus readers on the bits of wonder floating around outside those feelings, and the wondrous landscape in which these things come to life. Tan’s language is spare and complex – rich with imagery and wry insight. 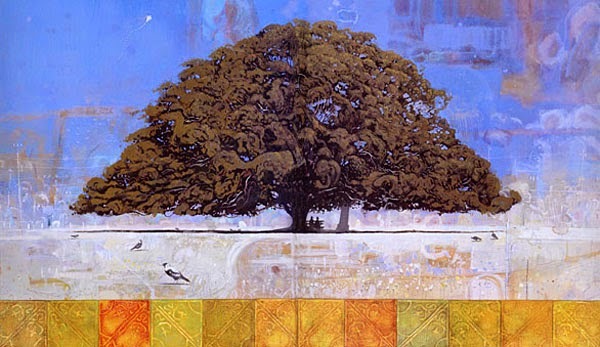 He has a gift for integrating the lyrical quality of dreams into waking life. In Tales from Outer Suburbia, he tells stories of aliens, stick people and ghosts. Fear is muted by the delight he takes that such things exist on the periphery of our horizons. His insights into the complexities of our desires for love, home, family and adventure are astonishing. His stories can amuse, but they can often break your heart open to reveal hidden chambers that glitter with magic and redemption. 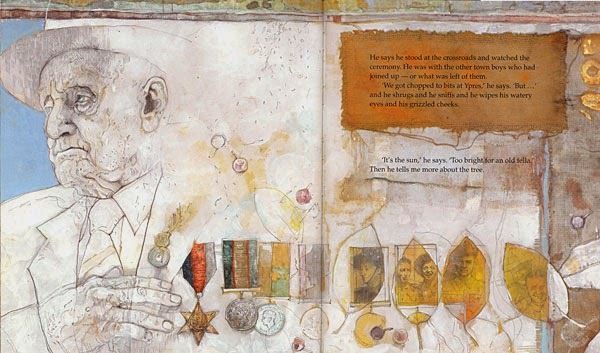 The illustrations and stories work seamlessly together, advancing the tales in a way words can’t. 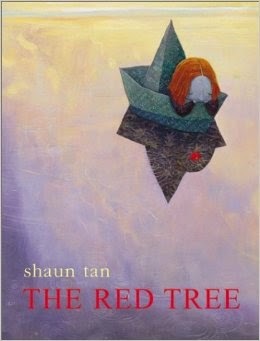 I found his book The Red Tree to be an accurate and moving portrayal of the way depression changes and skews your vision. The economy of language and depth of the images told the tale in a way I’d never before imagined. I was delighted by the simple way he told of how when depression passes, the whole world seems to glow with color. 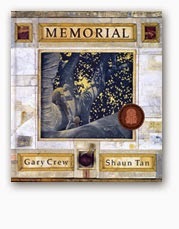 The book he illustrated for Gary Crews, Memorial, is an eloquent look at how war affects generations and the natural world as well. It shows how man’s desire for progress often destroys what is best about life, in this case a beloved tree that 3 generations of veterans have felt was an homage to their service, and their home life. It’s a poetic and beautiful book that is unfortunately out of print in the United States. It’s at the Multnomah County Library, though. 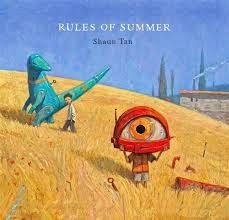 In his most recent book, Rules of Summer, Tan exploits the slipperiness of language and images with charm and grace. An older brother has given his young brother certain rules of caution about how to proceed through the vastness of summer. Full-page paintings have one-sentence rules, such as “Never leave a red sock on the clothesline.” The painting shows the two boys hiding behind a fence while a giant red rabbit glares at a single sock drying on the line. The rules conjure up their own reason for being. Each sparse rule becomes a catalyst for a visual journey. The Rules, for me, are a direct passage back to childhood, when the world wasn’t entirely understandable or safe, but anything could happen. It restores a sense of the largeness of life, of our imaginations, of our hearts. Tan is very generous with his images and time on the internet. 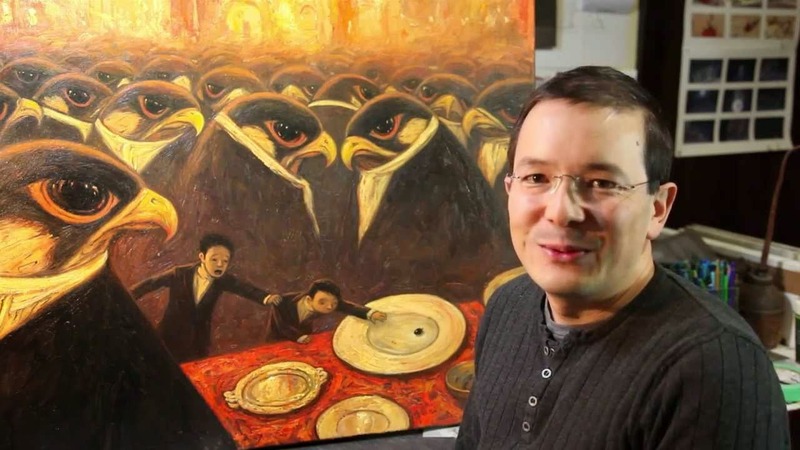 There are interviews with him on Youtube and he has a website, and a blog where he posts paintings he’s working on. Go explore his world. You’ll emerge from it with treasures that will enrich you forever. 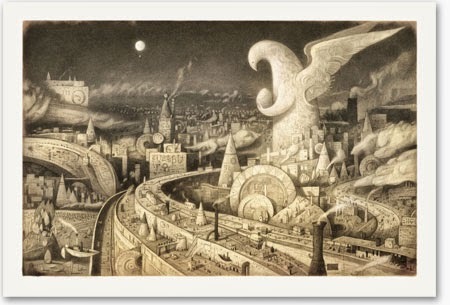 I had heard of Shaun Tan, but unfortunatelynever checked into his work. Thanks for this detailed intro, Joy–now I can make it a point to indulge! Again, you have inspired me to look past the end of my own nose, Joy. Thanks! Check out the Bird King: An Artist's Notebook. It's a great sketch book and shows a lot of his process. If I'm short of ideas, it always gives me new ones. There's a whole world just outside our noses. I'm glad we have so many artists and writers helping us see that.